Lawrence is located approximately 40 miles (roughly 64 km) west of Kansas City. If you’re planning on driving, KU’s Admissions Office provides directions to KU and tips for getting around Lawrence. Most major car rental companies have an office at MCI, and they share a common rental car shuttle that can take you from your terminal to the rental car shelter. You can get directions from the airport to your hotel (or the KU campus) on the MCI website. MCI provides many options for both private and shared-ride shuttles that can take you to and from the airport. Information about airport taxis can be found on the MCI website. 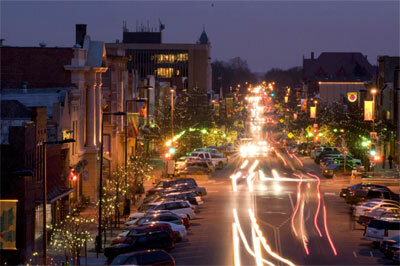 You can also book a cab through Jayhawk Taxi or Redy Cab, both based in Lawrence. The rate is typically around $100 (one-way) for 1-2 passengers. Additional information about ground transportation options can be found on the MCI website. Lawrence is also served by Amtrak. You can find more information on schedules and prices. The Lawrence Transit website has information regarding the bus system. The regular fare is $1 for a one-way trip, or you can buy a day pass for $2.75. Route information and bus schedules can be found online. Most bus routes serve the KU campus. Please note that not all bus routes operate during the summer; please consult the service calendar. Reroutes are also common in the summer due to construction, and updates are posted regularly to the Lawrence Transit site. Most conference activities will take place in the Kansas Union and the Oread Hotel, which are located within easy walking distance from one another. There is a parking garage located next to the Kansas Union. Parking in the garage is $1.75 for the first hour and $1.50 for each subsequent hour. Parking may also be found for free in the neighborhoods surrounding KU. Parking lots at KU are classified by color. KU classes will not be in session during the conference, so yellow zones will be open for free parking. More information and a parking map can be found on the KU Parking and Transit Office website.